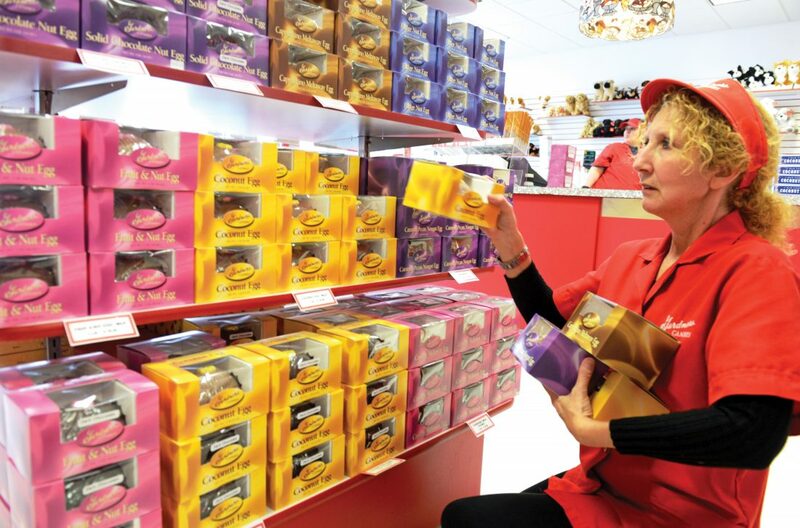 Mirror photo by Gary M. Baranec / Sandy Reighard restocks a display of chocolate Easter eggs at Gardners Candy at the Logan Town Centre store on Wednesday. Spending for Easter is expected to be about the same as last year, according to the National Retail Federation. “Easter 2019 spending is actually expected to be on par with spending in 2018 and the trend over the last several years. The year-over-year changes in both per person spending and the expected total are both within our survey’s margin of errors, so we would not say that consumers are expecting to spend less this year,” Director of Consumer and Industry Insights Katherine Cullen said. Consumers are expected to spend $5.74 billion on dining out, the same figure as last year. Several area establishments are offering Easter buffets. Don Delozier owns both Prime Sirloin Buffet in Duncansville and the U.S. Hotel and Tavern in Hollidaysburg. “At Prime Sirloin, we will have our traditional holiday buffet with ham, turkey and all of the trimmings — sauerkraut and pork, homemade pies, baked and fried chicken and more. Easter is a big day for us, but not as big as Mothers Day. It is comparable to Thanksgiving. We serve about 1,500 on a typical Easter,” Delozier said. Prime Sirloin will be open for breakfast from 7 to 10:30 a.m.
and the buffet will be served from 11 a.m. to 5 p.m.
Delozier said the U.S. Hotel and Tavern will serve about 200 people on Easter Sunday. The Altoona Grand Hotel typically attracts between 350 and 450 people to its Easter buffet, which will run from 10:30 a.m. to 2 p.m. The buffet features a carving station with prime rib and ham, an omelette station, a soup and salad station, numerous side dishes, assorted desserts and more, said Lindsay Danella, general manager. “Easter is a very important holiday for us. It is like eating dinner with your family. We like to welcome your family to our family,” Danella said. Consumers are expected to spend about $2.49 billion on candy. “It is our biggest holiday and the busiest two weeks of the year in our stores. Peanut butter meltaways are by far our number one seller. We also sell filled eggs, solid milk chocolate bunnies and assorted novelties,” said Sam Phillips, president of Gardners Candies, Tyrone. Phillips said Easter falling later on the calendar this year is good for business. Phillips said the increasing price of candy has had a small impact on business. “We do see people cutting back a little bit. The price of chocolate, like other commodities, is going up. We could reduce prices by cutting the quality of our chocolate that we get from Africa and Indonesia, but we will not cut back on the quality of the chocolate that we are known for,” Phillips said. Easter is also very important to Dutch Hill Chocolates and Blair Candy Co., both of Altoona. “It is big for us. It is right up there with Christmas and Valentine’s Day; they are all pretty equal,” Dutch Hill Chocolates owner Jerry Moore said. “Naturally, peanut butter meltaways are popular. We also do a lot of eggs. Fruit and nut and coconut eggs are also pretty popular,” he said, nothing the business also sells a lot of solid chocolate bunnies and novelty items from one ounce to one pound. “Despite the higher prices, people still come in and get their chocolate,” Moore said. Easter is pretty big for Blair Candy, said Mike Dandrea, director of sales. “It is up there with Christmas and Halloween for us. It is huge,” he said. “We order about $150,000 worth of Easter candy inventory to be stocked for the season,” he added. Dandrea said people relate jelly beans to Easter. Spending on Easter flowers is projected at $1.29 billion, up slightly from 2018. However, Easter is not a huge holiday for area florists. “Easter is a good holiday for us, but it is not huge,” said Debbie Arnsparger, owner of Creative Expressions Florist, 3977 Sixth Ave. “Easter is about potted plants and something simple for the dining room table, not something elaborate or over the top,” she said. “Potted plants make up the biggest of what we do. We sell a lot of daffodils, tulips and hyacinths. The hyacinths tell you that Easter is here. When you walk into the store, you can smell the hyacinths,” Arnsparger said. “Easter is not a giant holiday for us,” said Jeff Moist, manager at Warner’s Florist Gifts Greenhouses in Hollidaysburg. “The biggest part for us is the area churches with lilies, tulips, hyacinths and spring plants. We’ve added quite a few more churches in the last few years,” Moist said. “For the home, we make bunnies out of mums; they are very cute,” he added.